To enrich the stories of work and war, I have decided I’d like to hear love stories from the Swamp Ward. I usually try to encourage people I interview to talk about dating and marriage proposals. Sometimes they can’t remember too much (! ), but most times people are happy to share. On separate occasions, I interviewed Kevin and Sylvia Blaney, who have been married for thirty-five years. 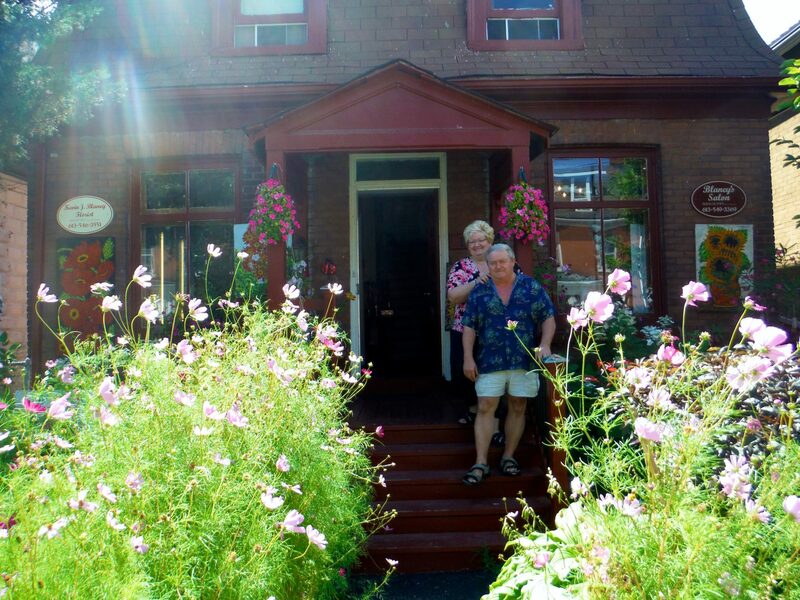 They currently own a hair salon and flower shop in the front of their house on Montreal street. Kevin and Sylvia outside their which is also their flower shop and hair salon. Since they grew up pretty much kitty corner at Montreal and Raglan, Kevin and Sylvia have known each other since they were children. But Kevin and Sylvia had some minor roadblocks before their relationship began: Sylvia’s childhood friend, Tammy Snider, had a crush on Kevin first. Kevin’s father, Earl J. Blaney, was one of the Swamp Ward’s beloved barbers. He ran his shop out of the Blaney family home on the corner of Montreal and Raglan. Sylvia remembers that she and Tammy would spy on Kevin from Tammy’s house, which was across the street from Earl’s shop. But in the end, it was Sylvia who ended up dating Kevin. Sylvia laughed about their first date when she was thirteen years old. They went to the Capital Theatre on Princess street to see the 1974 movie Towering Inferno and walked home through Skeleton Park afterwards. After years of dating, Kevin told me that he was confident Sylvia would say “yes” when he proposed. He remembers saving his money from his job working in the produce section at Bennett’s grocery to buy Sylvia a ring. Sylvia and Kevin got married in December 1980 when Kevin was 22 and Sylvia was 19. They still live on Montreal street as co-workers, parents, and supports for each other. Kevin told me how lucky he feels to have Sylvia by his side throughout his life. Please contact us if you would like to share memories about your own Swamp Ward romance!